– Totally new, nice and user-friendly interface! We hope you’ll enjoy it! – Support downloading HD NetFlix video! FlixGrab allows you to choose the original quality video from Low Quality (240p) up to High Definition (HD – 1080p or 720p)! – Support downloading Dolby Digital Surround Audio 5.1! – Support downloading subtitles in TTML format! – Support fast multi-stream downloading! FlixGrab is able to download multiple videos at the same time! – Automatic selection of the optimal voice quality and language! – Loading lists from a file! – Managing the download priority! 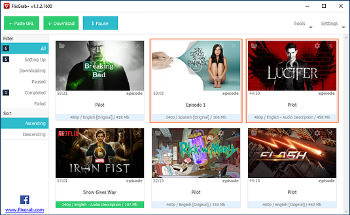 You can easily stop and resume the downloading process, choose video’s original language and much more! – Easy to use! Just copy any NetFlix video URL, paste it, click the ‘Download’ button, wait for a little and enjoy it! – It supports downloading the HD quality Netflix video. Moreover it lets you choose the original quality video from low resolution (240p) to high definition (1080p) (*). – You can even download the Dolby Digital Surround Audio 5.1 using this software (*). – A user can download multiple videos at same time using this awesome tool as it supports batch downloading (*). – The tool selects the optimal voice quality and language for the download. – The download process can easily be stopped and resumed from the point you left it (*). – Also it supports subtitles in TTML format. So you can even watch other language videos with this new subtitle feature (*). – Easy to use! Just copy any NetFlix video URL, paste it, click the ‘Download’ button, wait for a little and enjoy it.